Model - 1740. AT&T Digital Answering System. Needs the Power Adapter. Everything else new and included. See pics. GE Digital Telephone Answerer GE Digital Telephone Answerer with 30 Minute Recording Time, English / Spainish Voice Prompts and Touch Tone Remote and Message Retrival System. GE Cordless Telephone Answerer 900 MHz Digital Charger Manual 26990 40 Channel . Condition is Used. Shipped with USPS Priority Mail. 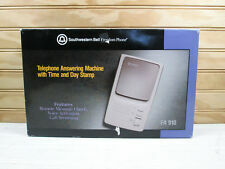 Bellsouth Digital Answering Machine Model 1188 NIB. Bellsouth #1188 digital answering machine. Southwestern Bell Freedom Phone FA910. New and unused in its open box. Removed from box for photos only. See photo of box for full list of features. Used Condition. The battery is old so it may need replaced. - Sony SPP-A967. Model: 1738. Excellent sound quality. All digital operation (no moving parts). Call screening/Intercept. Manufacturer: AT&T. Phone number annouce. Model IT-A205. Corded handset, wall jack and plug in power connector. Serial number B517386. Made in Taiwan. One touch dialing. Recall, hold, scratchpad and flash features. On hook dial. Redial/pause button. Condition: This answering machine is in used condition. It was looks to be in good shape. Has not been tested and will be sold as is. A few years back I was the recipient of my Uncle Harold's STUFF. Answering machine features Remote Turn-On. Beeperless Remote. 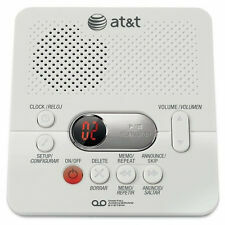 AT&T (1740WH) Digital Answering System with Time and Day Stamp, White About the product: ---Digital operation: Records outgoing announcements and incoming messages on a microchip. Tapeless operation ensures reliable performance, instant access to messages and the ability to selectively save and delete messages. ---60 minutes of digital recording time: Records up to 60 minutes of incoming messages, outgoing announcements and memos. ---Message Guard memory: protects against the loss of messages in the event of a power failure, so you can listen to your messages after the power returns. No batteries required. ---Time and date stamp: Announces the time and day of each message before playback. ---English/Spanish/French setup menu. Excellent condition. Looks like it was rarely used. Toll saver. Remote OGM change. Tape full detection. UP FOR SALE :A Pre-Owned AT&T Model 1719 Digital Answering Machine. 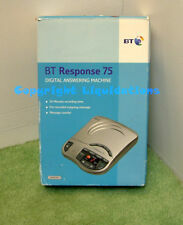 AT&T 1719 Digital Answering Machine. You are purchasing : A pre-owned AT&T digital answering machine. Model 1719. Tested and working condition. ACT XG2801 digital phone answer machine. NOTE: Any ?. 's, feel free to ask before buying. Sony TAM-100 Digital Answering Machine w/ AC Power Adaptor Free Shipping! This machine is tested in good used condition. No instructions included, but it's pretty easy to set up. Free shipping! Condition is Used and works great. It is in great shape but the power chord isn't there. Check out the photos! Works great! Two cassette tapes included. See photographs for details. It's a tree light with 152LED multi color and branches covered by black. Size: 152LED. 1.5M high black tree with transparent flower (PD039-2) with adaptor, for indoor use and outdoor use. Our tree led provide high quality. We have for sale:Bogen FR-2000 All Digital Voice Prompting Answering System ONLY NO ADAPTER. 1 x Changer Microphone. 8 different voices: Male (3 types), Female (3 types), Robot, and Original. Portable, wireless design. 1 x User manual. We are offering this Casio PhoneMate Digital Answering Machine - New open box. Never used. - Model TA-111. - Please see item details page for features. If you have any questions please feel free to contact us. Also, look under the "About the Seller" area and click the "Seller's Other Items" tab to see our other offerings. We thank you for looking at our listing. Bellsouth Answering Machine Bell South White 1129 Over 20 Features NIB Call Screening, Toll saver, Room monitor, Access to most features from an outside phone. This is in the box. The exact item pictured is the exact item you will receive. Model Number: 1718. We want to make your decision to buy from us a rich and rewarding experience. Overall Condition: Very Good. Remote code to access the machine. Conairphone Sport Telephone Digital Answering System Tad2012cbrb Condition is New. Shipped with USPS Priority Mail. Top reads "GE". MODEL: GE 29871GE3-A. Includes Users Guide - in English & Spanish. Only gently used. 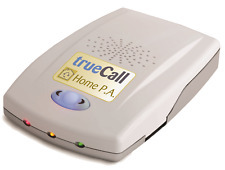 Call Screening Allows You To Listen To Incoming Calls Without Answering. Conair phone high energy Phone light Pink. Good pre-owned condition. Tested and works great (it speaks a lot of the instructions to you). 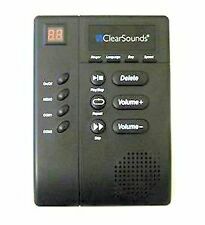 ClearSounds CLS ANS3000 Digital Amplified Answering Machine . Shipped with USPS Priority Mail. Product Type Answering Machine. Features Clock and Calendar. Recording Type Digital. Model Number 1740. Height 1.9. Total Number of Phone Lines 1. Color White. Physical Characteristics. LUCENT TECHNOLOGIES--. MODEL 1772. AT&T 2 LINE DIGITAL ANSWERING SYSTEM.